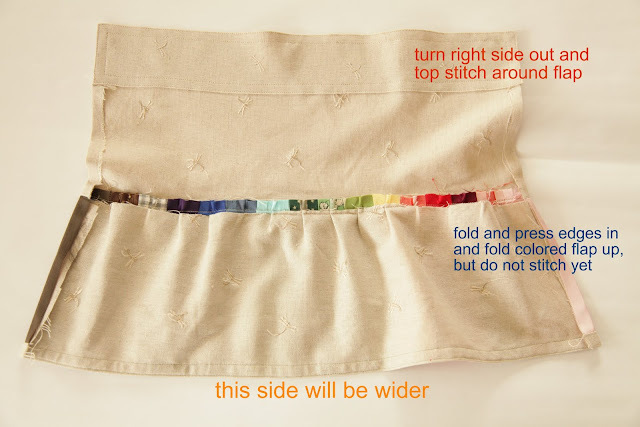 This has surprisingly turned out to be one of my most utilized sewing projects. I have absolutely loved being able to grab this on the go or being able to check that all colors are accounted for (go ahead and call me persnickety, I don't care because I have all my pens in a row :) If I had some really nice artists markers or quality colored pencils I might make more of these. I allow the kids to use them, but the color coordinated roll lets them know they need to take care of them. What are you persnickety about? It's been inspiring to see what can be made from a few little scraps, hasn't it? My scrap stash is getting out of control, to the point where I've let my five little girls get their hands on it and have some fun with their own creations. I'm so excited to be here at Living With Punks today! Some might call it obsessive, or snooty, my love of smooth rolling, fine writing pens. Free pens don't last long in our house, because inevitably my nice ones disappear and all I'm left with are the freebies who try to do a good job, I'm sure, but always disappoint. So. Like I said, I'm a pen snob. And I'm fine with that, because it makes me happy every time I have to jot something down to be able to pull out my best writing implement and glide that color creating contraption along a notebook. So today I'm sharing a fun way to o1 keep track of my lovelies o2 display them in an aesthetically pleasing way o3 easily grab them and go and certainly not least, o4 give away a set of my all time favorite pens that I used to think I had to travel to Japan to purchase! Let's start with the Pen Wrap & Roll. Now I've seen simplified versions of these for kids' crayons, but let's be honest, what kind of kid is going to keep his crayons nicely organized. And if you have that kind, send 'em over to me to teach my baby Dill's. But you, my fellow pen lovers, you will enjoy just looking at your pens when you've got this finished, and I have no doubt you'll have a hard time keeping your pens organized and pretty. 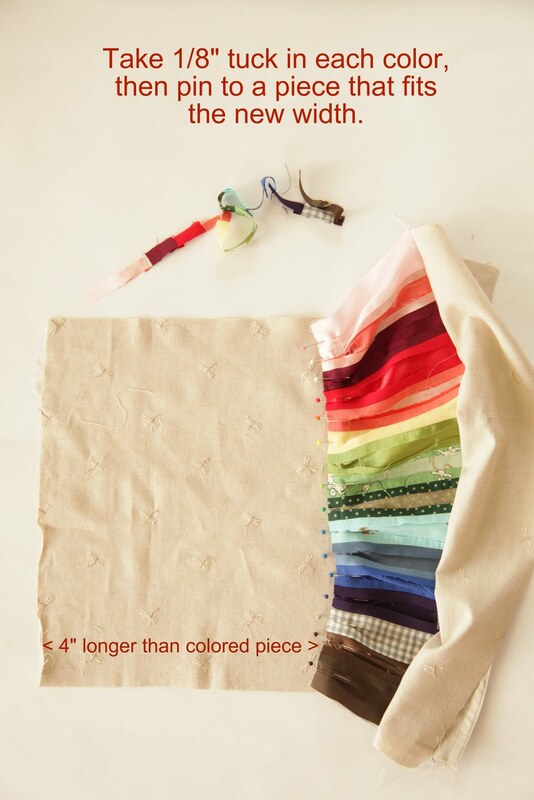 Start by grabbing your scraps and finding one that is the same or close to the color you plan to coordinate with. 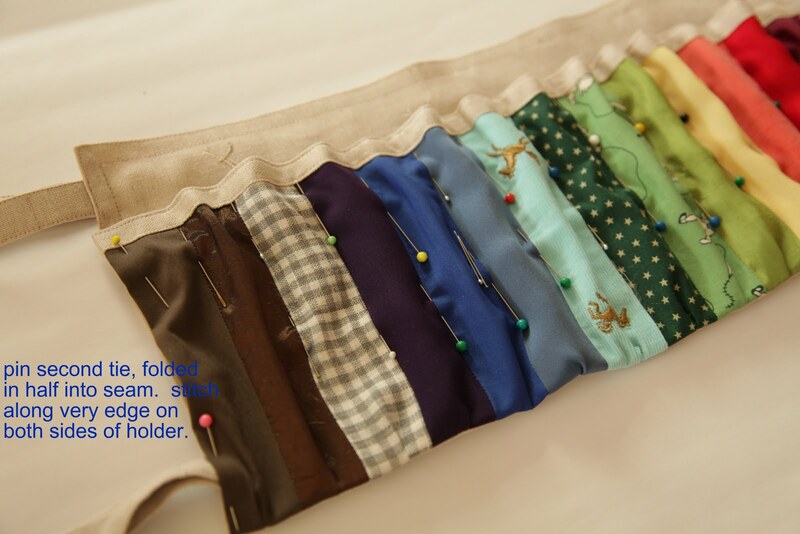 Iron and cut out a piece that will comfortably fit over your pen of choice, adding a 1/4 seam allowance on all sides. Pin all the pieces together and stitch with 1/4" seam allowance. The more precise you are with this the better your results, so if you've cut out a piece that seems a bit skiwampus, go ahead and cut a new piece. Note on fabric choice: although you're just using scraps, make sure they are not too thick. The thickest I have is a baby-wale corduroy and I wouldn't go any thicker than that. Quilting cottons, even lining will work well. See how pretty it is already? :) Press open all the seam allowances. There are lots, but it will make your project turn out much better if you take the time to do this. It would be helpful if you had one of those itty bitty irons, but I just used my regular iron, slowly going along and it turned out fine. Cut out a piece of neutral colored fabric for the lining. It should be just 1/2" wider than your colored panel. I cut mine the exact same size, which will show in the photos, but I liked the edge of the linen to show on the opposite side, so give yourself that extra to work with. Sew right sides together. 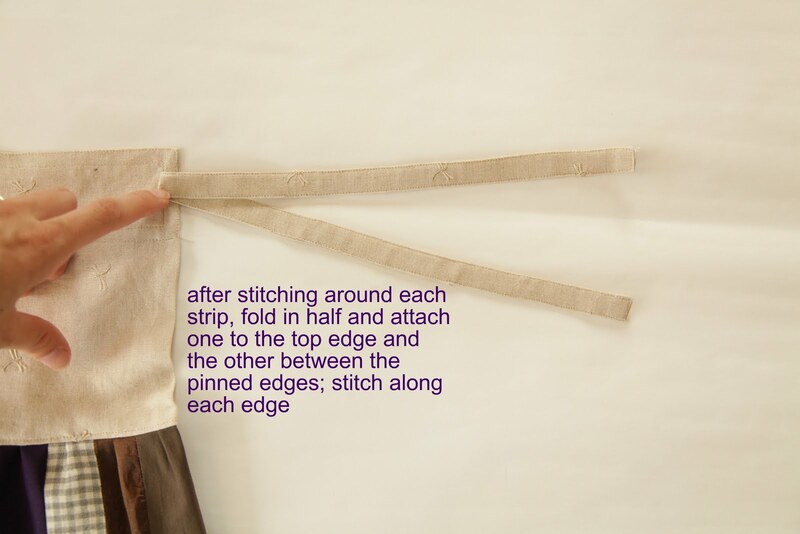 Fold together over the raw edge, not the stitching line, so the neutral fabric shows on the right side and top stitch along both edges of that neutral strip. Working your way down the rainbow panel, take a tiny tuck at the bottom of the raw edge, just 1/8" or so. I pulled back my lining so you could see the tucks in each panel of color, right in the center, but you'll want to make each tuck with the lining and panel as one. 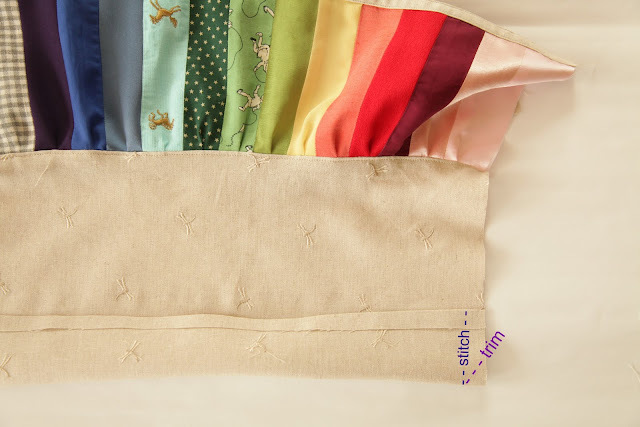 Once you've made the tucks, cut out another piece of your neutral fabric that matches the width (which is now shorter) and about 4" longer the opposite way. Stitch 1/4" and press seam flat. I edge stitched it along the neutral side before folding together, but that's optional. Fold the top down 1/2" and press, and repeat, folding down 2" the second time. 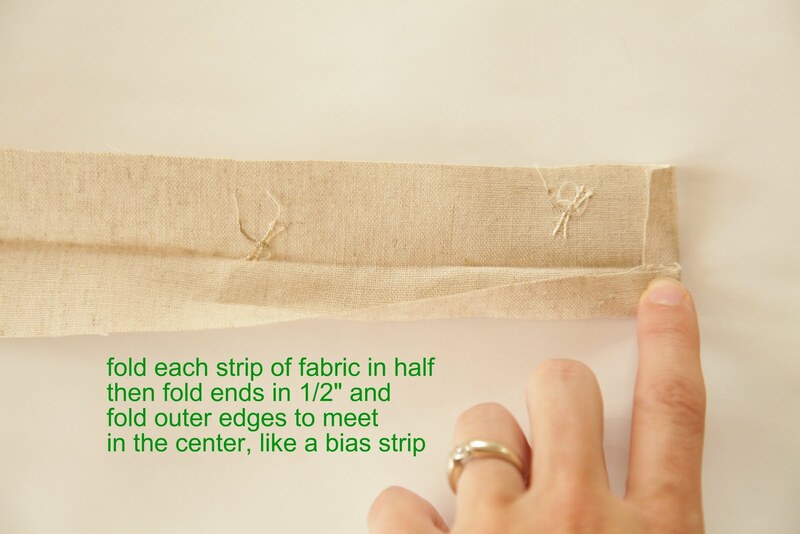 Turn your wrap over and fold the 2" fold you just made, the opposite way, right sides together and stitch 1/4" on both sides, trimming the corner off. Turn flap right side out, carefully pushing out the corners with a bone folder or other and top stitch around the perimeter. I stitched twice to match the edge of the color panel. Fold the outer edges in 1/4" and press, but wait to stitch them together, as we still need to make our ties to insert. Cut two strips 2" wide, the length will depend on how many pens you will be wrapping up, doubled. 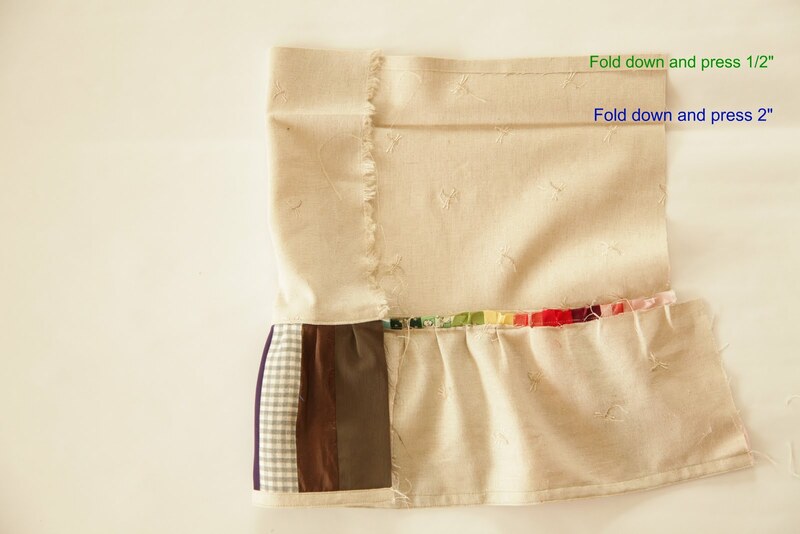 Fold like a hot dog and press and then open. Fold and press each end in 1/2" and then the outer edges in to meet the center line and press. Repeat with second strip of fabric. Stitch around each tie. 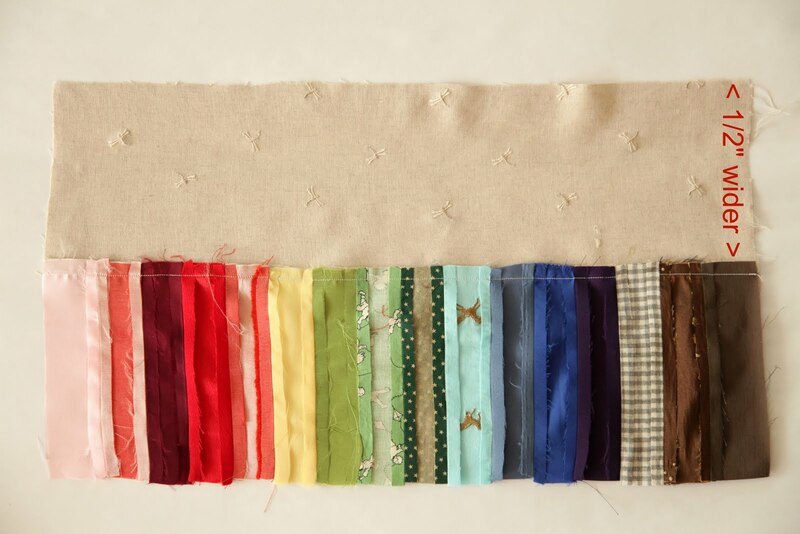 and the other inside the color panel, sandwiched between the neutral fabric and color piece. Stitch along the very edge to secure. Repeat with the other side, but without a tie. 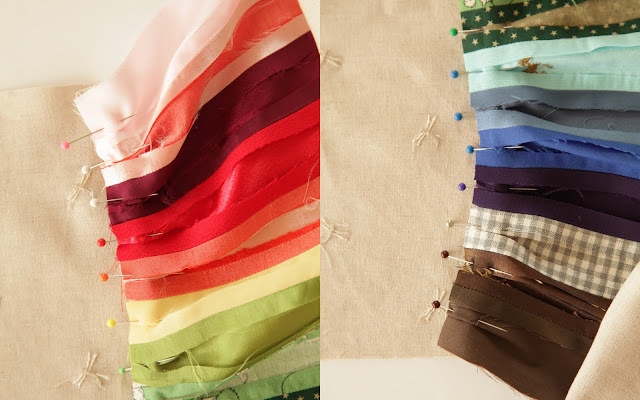 You want some slack in each color panel as you pin it in place. The top of the color needs to be lined up with the bottom. Using clear polyester thread, stitch "in the ditch" or right on the seam of each panel, creating the pocket for each pen. Make sure you sufficiently backstitch on each end, and ta-da! 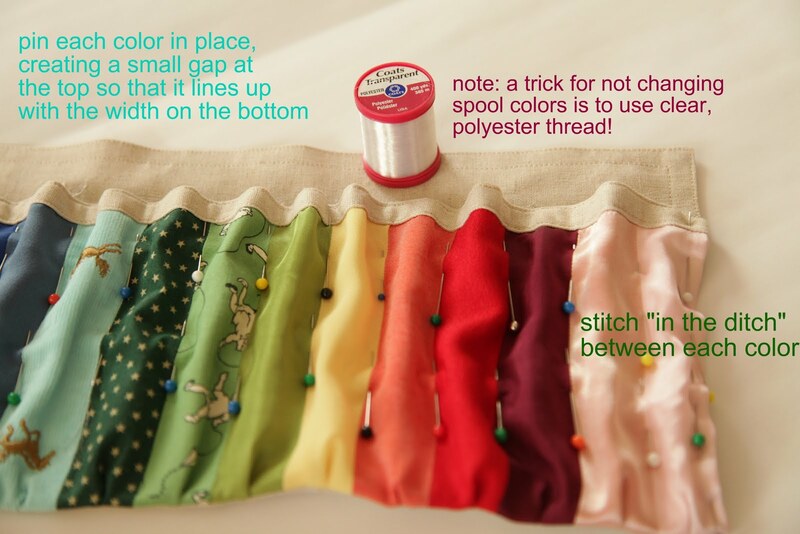 Your thread automatically matches your fabric! 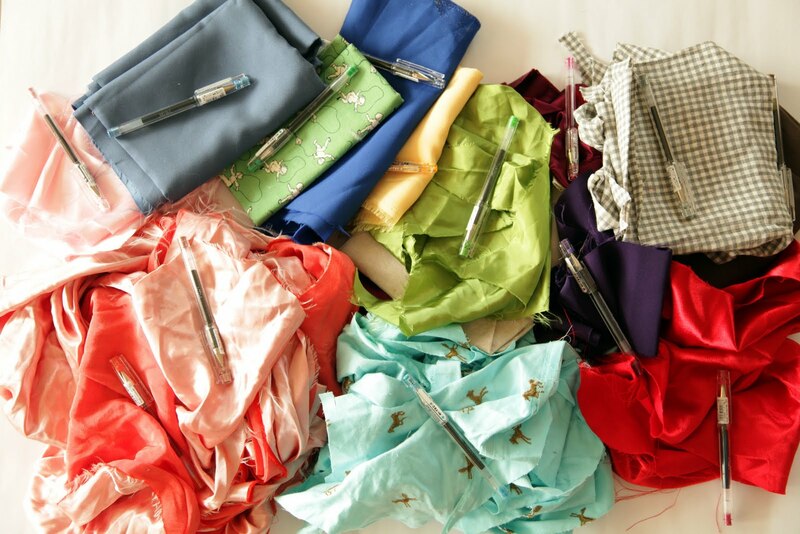 Then you can lovingly tuck each pen into their coordinating cozy of a new home. When I showed Ryan my completed Roll he said it looked very Asian. Perfect. Thanks for having me, Susan and Living With Punks Readers! That's such a cute one !!! This was a nice tutorial enhanced with great photos. 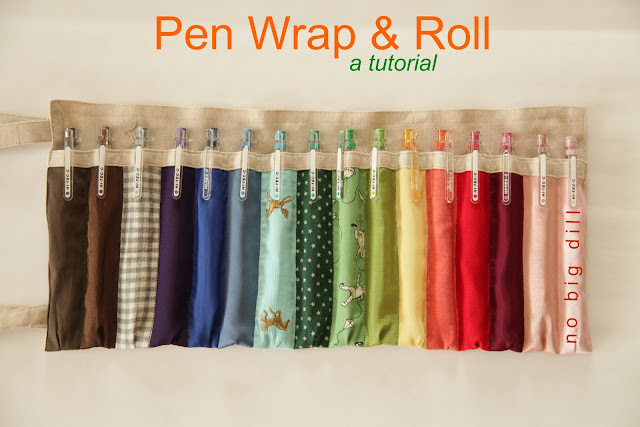 I keep looking at this tutorial - I love the organised nature of the pen roll and the rainbow colours! I *must* make one for me! Thanks for the wonderful tutorials. These skirts were so beautiful! 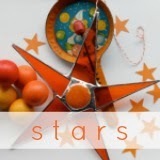 I want to invite you to participate in Craft Snob's Handmade Ornament Parade. If you are interested send me an email and I will send you more details. Hi Katy, I'am a french fan : sorry about my very bad english. I just want to say thank you for your blog and your tutorial. I make a ruffled skirt black and white for my niece and I hope I can finish ! Have a good day (4 hours afternoon in France). You are so lovely kids ! I remember this from the original post and it's still super cute!! This is such a unique idea. I can see why it would be helpful too. I'll be adding it to the site and linking to your designer profile soon. what a great idea! I have seen it for crayons but have never considered that it could be used for pens. Love it!